We had left Madrid early, so at about ten o'clock we were coming to the small salmantina town of Tamames. By following the instructions of the navigator we gave our destination, a "window to the past", the door old workshop, open and waiting. There they were Arquímedes García Y Elysium, his brother inside what could well be a garage where he weather It had stopped in 60. 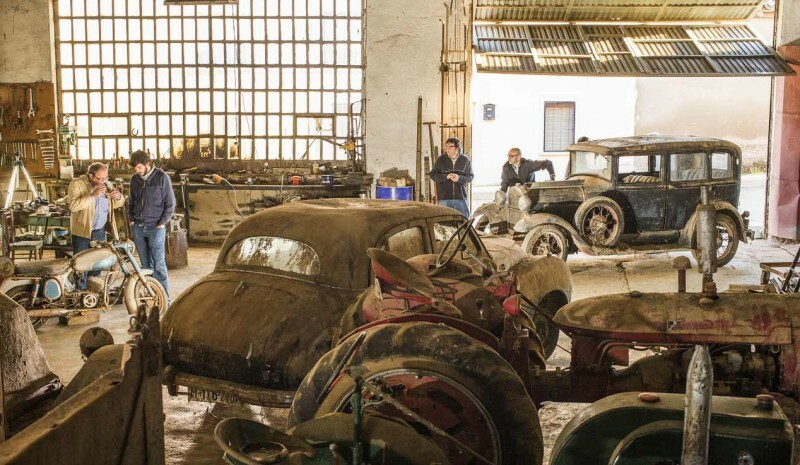 It dimly illuminated by the morning light coming through the open door and window on small vertical windows-so common in old workshops and glimpsed one garajes- collection of classic cars of all kinds, but conveniently covered with dust and signs have not moved since it was at least forty years. "Untouched" they would say the English. Not only had the cars, as well trucks, motorcycles and old tractors immediately they called our attention. 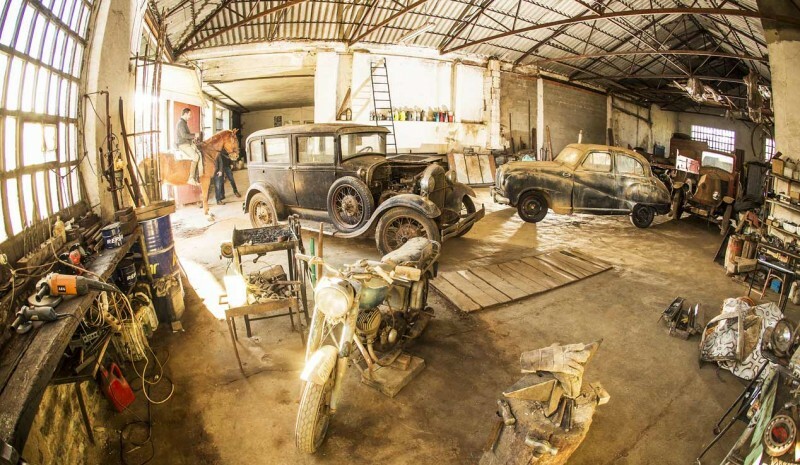 He Local stale He was not wasted, and its corners are searching for and tools decades ago, as old pieces like the vehicles themselves and trinkets of various kinds. On the shelf of a corner there were several car radios 50s; We found in another drawer hood ornaments a car from the 50s, 20s headlights, handles all types or pretty rounded back plates E of Spain. Some of those pieces ... unworn! And, an ancient anvil, old furniture, farm implements other times ... Come on, a real mixed bag. He welcoming us and almost poking through the door was the Ford A 1929. We started to get into this interesting cave and behind it, in a row, we came across a Austin A70 Hereford those manufactured from 1948 and 1954, and further back with a spectacular crane 20s, namely a Renault Type MZ 1925. Beside and contrasted by its enormous size-at least compared with the Barreiros Saeta Renault- was 65 of 60, and before it, two separate tractors of the 40 The first, a strange and tiny John Deere somewhat modified, and beside a typical International Harvester Model FC with characteristic and very narrow front axle. 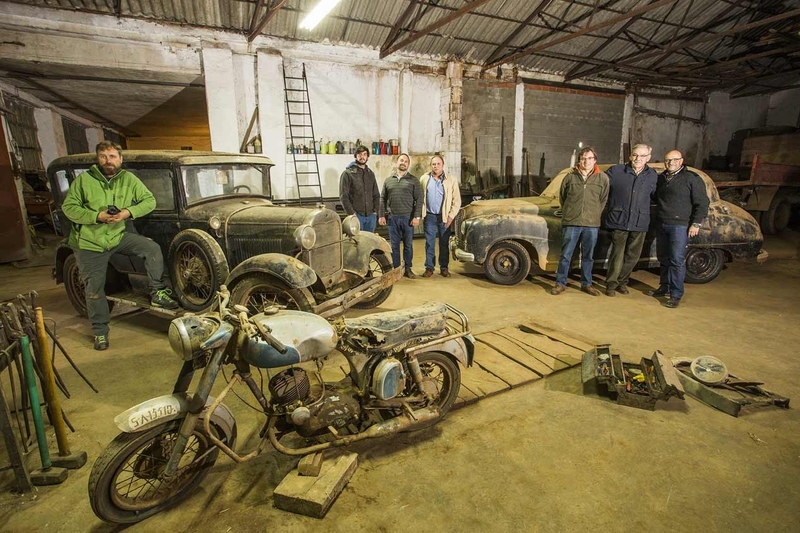 Among all these hulks also it appeared a small motorbike ISO 125 Gran Turismo early 60s, made in Spain by Borgward Iso Spanish S.A.
Apart from the incentive that involves meeting with a group of vehicles as authentic as that state was the story of most of them is known and worth telling. Archimedes, the discoverer, currently resides far from Tamames, but his family is from there lifetime. His fondness for classic cars is that not many years ago acquired a Seat 850 Spider and he subjected to an extensive restoration, leaving it as new. Once the "bug" stuck in the body, Archimedes tried to get hold of an old car that saved forever remembered in his hometown. 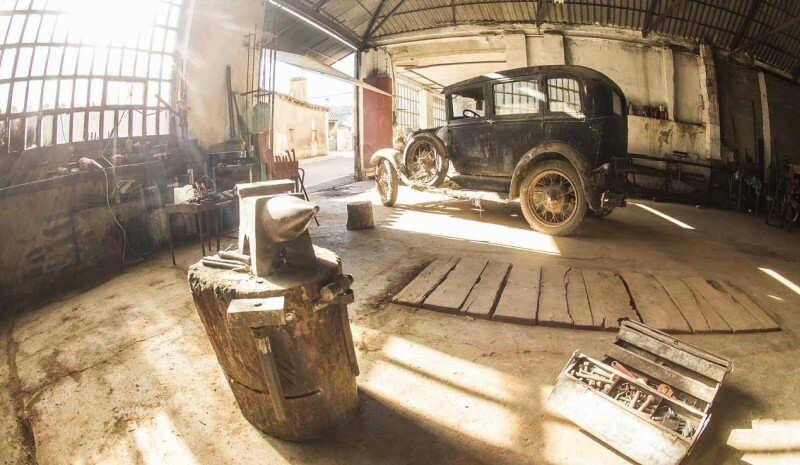 It was the Ford A, a car that is also very easy to repair because it is simple, robust and new spare parts are very easily. Long years of attempts and negotiations always came to the same end, the refusal of the owner to get rid of Ford. Finally, logic prevailed, and the octogenarian owner agreed to sell it ... provided they also take away other vehicles that accompanied it, which exactly are the protagonists of this article. Archimedes had never thought, even remotely, be done with such a collection, which also included hulks such as tractors or Barreiros truck, but once I reached that point, he could not say no. For many others-some years more than all these vehicles were kept in an old ship whose adobe walls were already losing their coating, which, little by little, was smearing our protagonists with a sand and dust layer. On the floor of the ship and between cars had straw bales almost undone, so you could say they were, as used to happen in a real barn. But how did they get there? 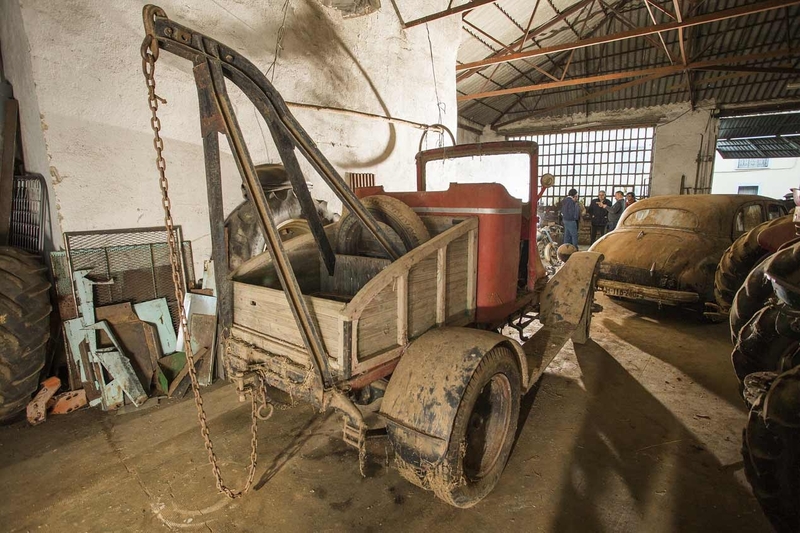 Lucas, the former owner, was the village life, and throughout his extensive career-mechanical truck driver was treasuring pots with the help of his uncle Josele, who first started the business. The oldest is the Renault truck, which it was released in July 1925 by the company Union Electrica Madrileña, as still bears witness to a chapita on your dashboard. We can assume, therefore, that after several years electrifying the streets of Madrid, was sold at auction and ended his days working as a crane in tamames. 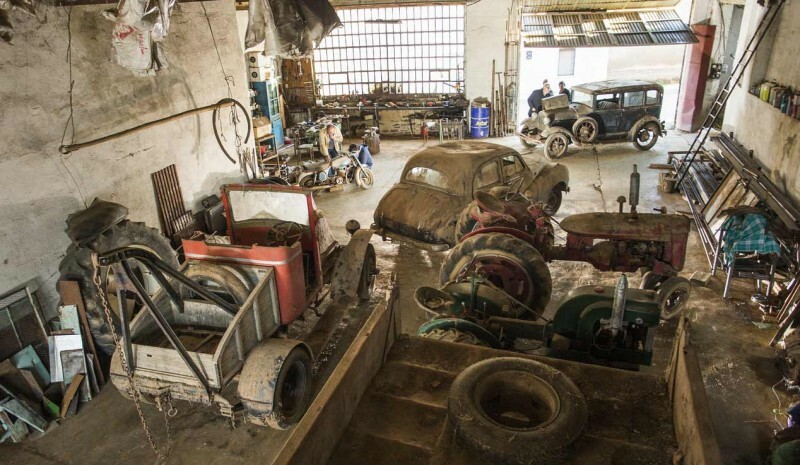 His condition is incredibly good, as under the dirt You can still see a painting in very good condition, or an engine whose components still shine apart from turn crank without the slightest problem. Everything about it is original, with the only downside that his cabin was modified. According to tell us, the Renault ended up being used in the 70s to drag the bulls out of the bullring once the job finished, and its owner decided to make it convertible for this function. The A history of the Ford 1929 is no less interesting. Has a body "Town Sedan" four-door, the most luxurious in the catalog of Ford that year. He was enrolled in Burgos in June following the bishopric of Burgos year, and for some years was the official car of the burgalés prelate. From the 40 owners had some more until it made landfall in Tamames, but certainly their owners should be very careful. Today this Ford A is in good condition, and all those aftermarket headlights are brand JBH (José Biosca Hermanos) of Spanish manufacture. Otherwise everything is in place and in good condition. The combination of black -aletas colors, dark blue body and wheels and filleted in garnet is very worn ... but still, and it sure is the factory. And even on the mechanical side there are positive signs. Both management and the brakes worked perfectly ... even less slack than other Ford A restored and I had occasion to drive. He Austin A70 Hereford It is in much worse shape. He came to the shop in the 60s for a repair on your brakes, but it seems that its owner never returned to pick it up. 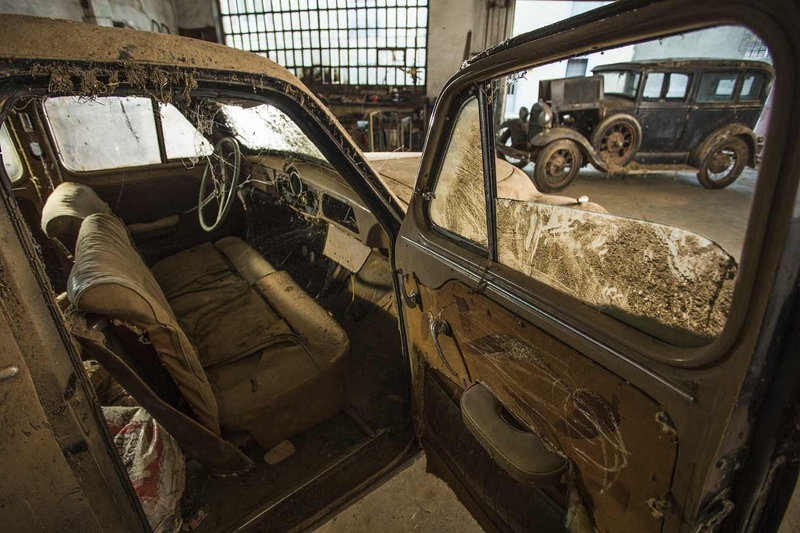 As a necessary space occupied was taken outside, where he spent long years in which some children used it as a makeshift toy breaking headlights, rear lights and various interior elements such as box watches or parts of the upholstery. The underbody are not at their best, and yet he is still covered in a layer of sand -literal-. The bottom of garage, half hidden, was the Barreiros Saeta 65. He was enrolled in Salamanca in August 1964, and requested and approved with elongated cabin for six occupants, since apart from transporting wood also used occasionally to make changes. His condition is so good that by cleaning and tuning enough, and have been since he was new to this same location. مازدا RX-8 المستعملة: من 6000 يورو أقل! Qual è la migliore berlina premium?